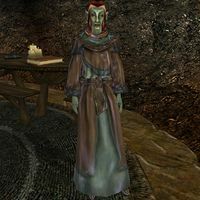 Miraso Seran is a Dunmer enchantress who works for the Tribunal Temple at their small chapel inside the Telvanni Council House in Sadrith Mora. She has a selection of magical scrolls and other items for sale, as well as offering enchanting services. This page was last modified on 11 December 2013, at 01:20.